Back in September I wrote about a phenomenon known as a gamma ray burst (GRB). A GRB is an intense emission of gamma rays that occasionally appear in the sky. There are various proposed mechanisms for GRBs, but one of these is the collapse of a large star (a hypernova) that causes the star’s core to collapse into a black hole. This means that a study of GRBs could give us a better understanding of how black holes form. But studying a gamma ray burst is a challenge because they tend last for a short time. Short ones last only a couple seconds. Every now and then, however, one will last for much longer. One such long-duration burst occurred in April this year, lasting long enough for several different telescopes to make observations of it. The results of those observations have now been published in Science (paywalled, but arxiv here). The initial detection of the burst came from the Fermi gamma ray telescope, followed by the Swift satellite observing in gamma, x-ray and visible light. A bit later the NuStar satellite observed the burst in the high-energy x-ray range. These were accompanied by ground based observations. 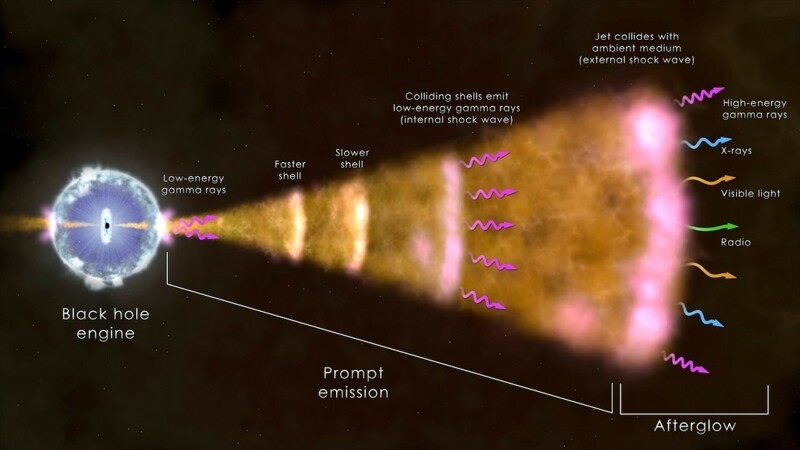 As a result, this gamma ray burst was observed at a full range of wavelengths, from radio, through visible and ultraviolet, all the way to x-rays and gamma rays. It is the first time we’ve had a wide spectrum of data on a gamma ray burst. The basic cause of a GRB such as this is the collapse of a star into a black hole. As the core of the star collapses, high energy jets stream out from its poles (as seen in the artist rendering above). The jets don’t stream at a constant rate, but tend to occur in bursts, leading to shells of plasma that shoot outward. Some of these shells move faster than others, which means shells occasionally collide, producing low energy gamma rays. High energy gamma rays are produced when the jets collide (at nearly the speed of light) with surrounding interstellar media. It is this collision that produces the burst of gamma rays we see as a gamma ray burst. We’ve known that the burst of gamma rays should correlate with the burst of light at other wavelengths, but the authors point out an interesting relation. The brightness curve of light in the visible spectrum correlates with the brightness curve of the high-energy gamma rays, rather than the lower energy ones. This is interesting because it was generally thought that the internal collisions (known as reverse shock) would produce most of the visible light. What the team found was that the external collisions with the interstellar media is producing the most visible light. That raises the question of how a relativistic stream of matter colliding with interstellar gas can produce not only x-rays and gamma rays, but a large amount of visible light. Right now we aren’t sure. Future studies of the data may give us more clues.